The farmers market is crowded this morning. Vegetables in every color are laid out across tables like squares on patchwork quilts. Dogs on leashes strain toward each other or the enticing hydrant on the corner. Babies bask in strollers with dribbles down their chubby chins. Toddlers place one hand in Mama’s and wrap the other around organic all-fruit Popsicles. Oh dear, there it is. The weekly tragedy. A grip loosened in a moment of forgetfulness or exuberance and that Popsicle falling down, down, down to land with a splat on the sizzling pavement. No? You don’t like that version of the story? Then how about this one: Mama leans in and speaks soothing words until that river dries up, the nose is not so pink, and the only sounds are a slight sniffling. She speaks until the little head nods and the smile returns and the hand is taken again. Then the two go off in search of another Popsicle, or perhaps something even better. Sometimes it is more complicated than this. Sometimes it is harder and takes longer. But this is the actual plotline I’ve been audience to again and again. This makes sense to us, and even if it’s not what we’ve personally experienced, it’s what seems right to us—that a parent would comfort a child even over the little things. Yet I will confess I’ve often not expected God to treat me this way. Sometimes I’ve been hurt or faced a loss or found fear catching me by surprise and I’ve told myself, “This is too insignificant to bother God about. It’s nothing compared to what other people face.” Then I think of the news headline, the social media post, or the prayer request, and I tell myself I’m selfish for even thinking I have a right to mourn. I thought afterward, with a bit of surprise, that this must be how the heart of our God is toward us. He is not waiting for us to get over it, to snap out of it and put on a brave face. He is instead coming for us with outstretched arms to wipe the tears from our cheeks, to pull us close, to whisper loving words until we are ready to take His hand again. Yes, we need to know nothing is too big for our God to handle. But we also need to know nothing is too small for Him to reach out His hands to us and hold us close. Comforter, it means so much to know You care about every detail of my life. Today I’m struggling with _____________. Thank You for listening, responding, and walking through this with me. Amen. 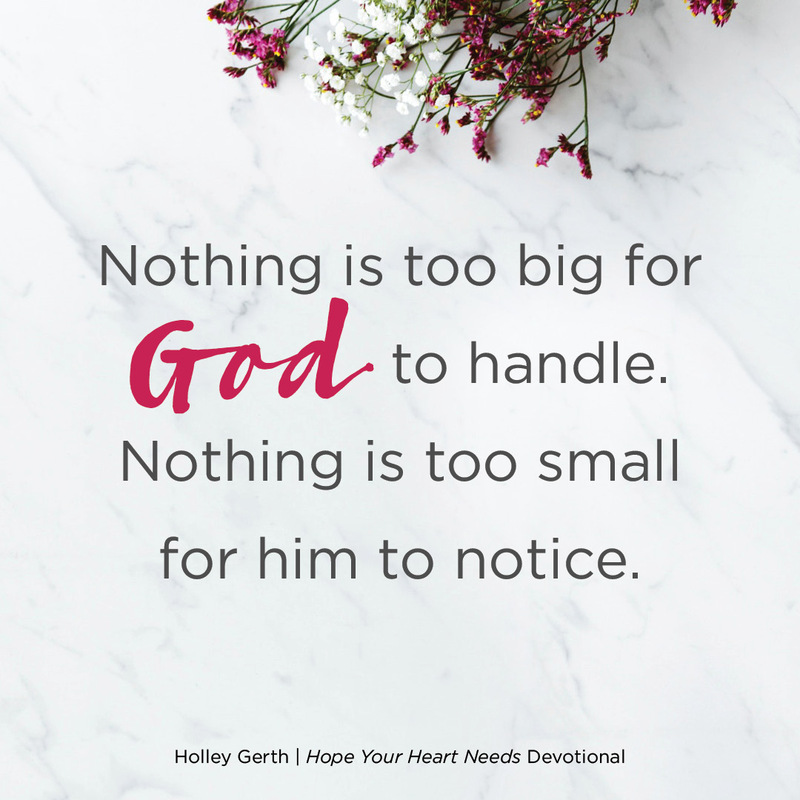 Exciting News: This post is an excerpt from Hope Your Heart Needs: 52 Encouraging Reminders of How God Cares for You (releasing next week!). God used the truths in this book to bring new hope and strength to my weary, discouraged heart and now I’m sharing them with you. Preorder your copies now or read another free excerpt. Compassion is kindly offering to send a signed copy to anyone who sponsors a child through this link. 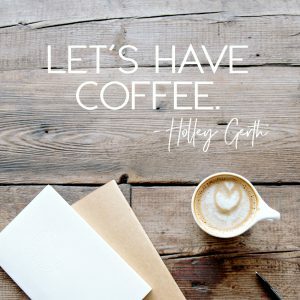 Holley, I’ve been that one worried that my needs, my heart aches, are too small to share with my Heavenly Father. He’s shown me, though, that He cares about the smallest of details in my life. Because He loves me. There’s comfort in this truth. He’s a safe place I can turn to . . . both when life-struggles feel overwhelmingly big, and when there are “small” things going on. Nothing is too insignificant for Him. What a lovely reminder this morning of how deeply God cares, but also how accurately He sees. He knows all the big things and still He cares about the little things. Thank you for reminding me! What a perfect analogy! Just like a good parent cares about all the hurts – big and small, so does God care about our troubles. Even ones as small as a dropped popsicle! His ear is always tuned to us and His arm outstretched toward us! Great reminder of God’s tender care with our concerns, both big and small. I love this, Holley: “There is no size limit. No height requirement. No difficulty level assigned.” If it matters to me, it matters to him. God says to cast ALL our cares on Him. ALL means everything. Like you said if it matter to you it matters to Him. We need to take each & every little care to Him. Nothing absolutely nothing is to trifling for Him. He wants to have a conversation with us. We need to learn to converse with Him about each daily detail. Talk to Him like you would a friend. Not leaving out one single detail. He loves hearing our stories & knows our needs before we even ask. Just bring it to Him! That popsicle-replacing parent provides the perfect illustration of God’s compassion for his children. And, oh, yes–praise God he is always ready to listen, respond, and walk through EVERY situation with us. Thank you, Holley, for this delightful dose of encouragement! I love it that God is with us all of the time. He comforts us. I love this. When I think about how much I love my children, and now my grandchildren, (my “babygrands!”) and remember that God loves us all even more, it brings such comfort and joy to my very core. God is good, all the time! GOD RICHLY BLESS YOU HOLLEY! THANKS FOR THIS REMINDER! MAY THE LORD EVER KEEP US CLOSE TO HIM AND MAY WE ALL GO TO HEAVEN!